On its 50th anniversary, the landmark theory of island biogeography—the study of the distribution of species on islands over time—expands from land to sea with fascinating results. A team of researchers led by Dr. Hudson Pinheiro, postdoctoral ichthyologist at the California Academy of Sciences, have proposed a new conceptual model of island biogeography for marine organisms—a theory that explores how different processes (like sea level fluctuations and geographic isolation) influence marine species diversity around islands. The team found that, despite some similarities, the forces that tend to shape diversification and community assemblage on land are different from those that impact islands' marine environments. Results—authored by researchers from the Academy, University of California, Santa Cruz, and Universidade Federal do Espírito Santo—are published today in Nature. The new model suggests that marine species are better dispersers than land-based animals—arriving quickly around inhabitable islands to fill available ocean niches. This fast action by skilled dispersers leaves no chance for adaptation to cause species to change and fill new niches, as is typically seen over time on terrestrial island habitats. "In order to crack the forces that shape ocean life around islands, we decided to dig into the evolutionary history of Brazilian reef fishes," says Pinheiro, Academy researcher and member of its Hope for Reefs team. 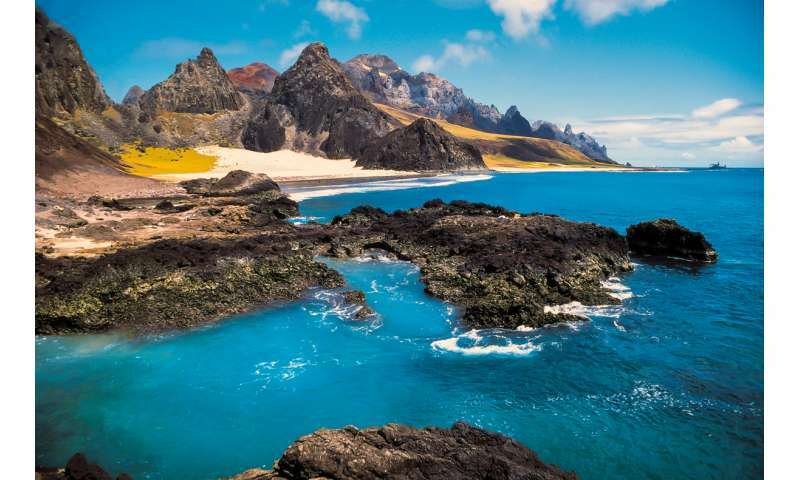 "When we focused on 10 species in a chain of volcanic seamounts and islands off the coast of Brazil, we saw that older endemic species were larger. These large fishes were better dispersers than their 'younger' species counterparts, which were all small, bad dispersers. It's clear that these unique marine environments need their own model to explain what lives where over time." 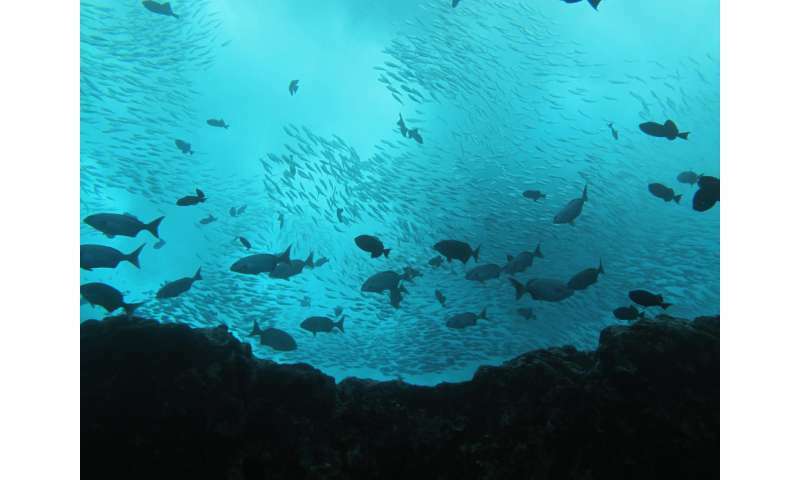 By tracing the evolutionary history of the reef fishes restricted to this specific chain of seamounts and islands through their DNA, the scientists were able to better understand exactly how island geography, geological history, and sea level fluctuations generally impact the diversity of nearby marine species. Fishes were collected from both shallow and deep reef locations—the dives requiring specialized equipment called rebreathers that Pinheiro and his Academy colleagues use to dive 200 to 500 feet beneath the ocean's surface. The findings confirm that sea level changes and the locations of exposed seamounts play a critical role in marine evolution over time, mainly by intermittently providing stepping-stones for weak disperser species to colonize island habitats. "We're finally understanding how the complex, ever-changing web of island life on land differs from the same web in the ocean," says senior author Dr. Luiz Rocha, Academy curator of ichthyology and co-leader of the Hope for Reefs initiative. "Think of iconic Galápagos finches—when their ancestor arrived in the region, there were many empty land niches to fill and adaptations emerged to help them specialize over time. It's simply not the same in island marine habitats. Fast-dispersing marine organisms quickly colonize available niches, and we don't see the same pattern of specialized adaptation over time." In 1967, Drs. Robert H. MacArthur and E.O. Wilson pioneered the field of island biogeography as a way to explain the distribution of species around the world—how they move, change, and occasionally go extinct. Islands isolated by water could be viewed as splintered habitats with higher extinction rates than their larger, continuous counterparts like continents and their coastlines. "Our research team had quite an exciting brainstorming session about testing a marine biogeography theory," says co-author Dr. Giacomo Bernardi, University of California, Santa Cruz professor of ecology and evolutionary biology and California Academy of Sciences Fellow. "We knew that MacArthur and Wilson came up with parts of their theory by drawing on restaurant napkins. We were drawing our hypotheses on paper towels in a lab. This type of scientific collaboration is exciting, and the foundational work of innovative predecessors helps make it happen." Understanding the forces that help shape what allows species to persist in (and adapt to) different environments over time is a useful tool in tailoring conservation work and modeling for the future. This field of research has prompted new generations of scientists—including the authors of the Nature paper—to push for a more detailed understanding of evolution during our modern time of mass species extinction and rapidly changing climate. "Pulling out patterns in nature is important," says Bernardi. "We tend to think of the ocean as a fast-moving soup of larvae constantly invading regions and dying, but it's not total chaos. We have to find the methods in the madness." Terrestrial and marine environments are both vulnerable to the never-before-seen wave of species die-off—called the "sixth mass extinction"—currently underway. The global community risks losing valuable marine ecosystems like coral reefs—systems that support the livelihoods and well-being of billions of people worldwide—to the combined impacts of overfishing, habitat destruction, water pollution, climate change, and ocean acidification. At least a quarter of the world's reefs have already been lost, with another 30% predicted to die in the next thirty years. "We have hope," says lead author Pinheiro. "The more we uncover about dynamic marine environments and how they change over time, the better we can plan to protect them from future threats. This study sheds light on the ebb and flow of marine life on islands over evolutionary time. My role as a scientist is to chase the light, and encourage others to do the same."